New patrons waiting in line outside of Unexpected Productions’ Market Theater may be startled by what they see on the front wall of the theater: designs made by thousands of pieces of chewed gum. The wall began more respectably. Early 20th century farmers came to the Market to sell produce in the Economy Building. Later, the building housed a movie theater. Established improv theater company, Unexpected Productions, began leasing the building 1991. Soon after, a patron waiting in the ticket line to see Theatresports, a popular competition improv comedy show (still running today), stuck a piece of chewed gum to the wall, topping it with a penny. Others soon followed suit. By the end of 1995, the wall was covered with the coin-topped chewed gum offering. One day, someone in need of money took all the coins, but left the gum. The idea stuck. The landlord – Pike Place Market Preservation and Development Authority (PDA) – was offended that theatergoers would deface the historic brick building and asked Unexpected Productions to remove the gum. The gum quickly returned, and the PDA asked that the wall be again be scraped clean. In 1998, after patrons reconstructed the wall a third time, the Market finally gave up and the tradition was in full swing. The wall continues to grow and evolve to this day, and much like an improv performance, it is different every single day. Creators of the gum wall have taken their time, spelling out their name or their significant other’s name along the wall. Others have posted their hometown or their home country. And a few have even put up messages of hope and peace. Seattleites use the gum wall in a variety of ways, even as an unusual backdrop for wedding photos, something the theater staff sees about twice a month. Photographs of the wall also have graced business brochures. Tour groups visiting the Market stop daily to see it. 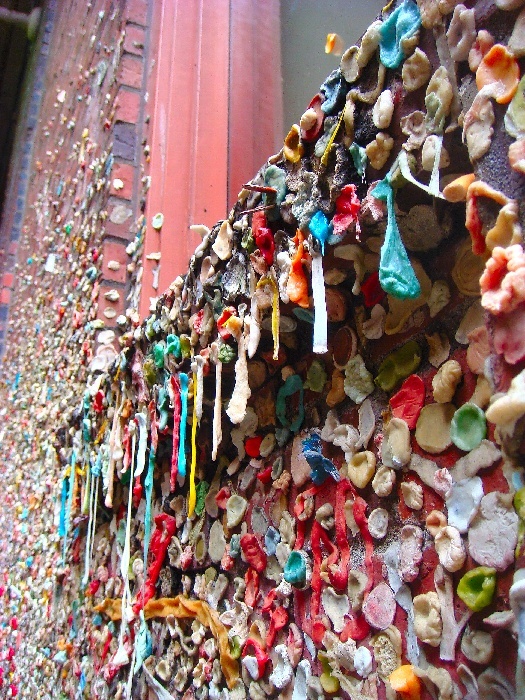 At 8 feet high and 54 feet wide, there are an estimated over 50 pieces of gum per brick or over 250,000 wads of gum on the wall. ”One of the 10 greatest places to sample quirky Americana.